Delicious butter cookies are divided to make two flavors, made to look like ribbons, for the holidays. With chocolate, pecan, and cherry strips, the cookies make a festive treat for the holidays. And packing the layers in the loaf pan makes preparation faster and easier than rolled ribbon cookies. These cookies freeze well, which makes them especially convenient. It's always nice to have special cookies in the freezer for unexpected guests and visiting family. In a large mixing bowl with an electric mixer, cream butter and sugar until light and fluffy. Add the lightly beaten egg and vanilla; beat thoroughly. Add the flour mixture to the creamed mixture and beat until well blended. Divide the dough into three parts (about 10 ounces each if you're weighing the dough) and put them in separate bowls. To one portion, beat in the chopped cherries. If more color is desired, beat in a small amount of food coloring. To the second portion, add 1/4 cup of chopped pecans. To the third portion, beat in the melted chocolate and another 1/4 cup of chopped pecans, if desired. Line a small loaf pan (8 1/2-by-4 1/2) with waxed paper or parchment; pack the chocolate dough evenly into the bottom of the loaf pan. Over the chocolate pecan dough, pack the plain pecan dough and then top it with the cherry dough. Or layer as desired. Cover the pan with waxed paper or plastic wrap and place it in the refrigerator for about 3 hours, or until thoroughly chilled. Grease baking sheets or line with parchment paper or silicone baking mats. Turn the chilled dough out of the pan and remove the paper. Slice the loaf of dough thinly and place the rectangular cookies on the prepared baking sheet about 1 inch apart. Bake in the preheated oven for 8 to 10 minutes, or until the edges begin to brown. Makes about 5 to 6 dozen ribbon cookies. You might also like these chocolate and vanilla pinwheel cookies or the date pinwheel cookies. 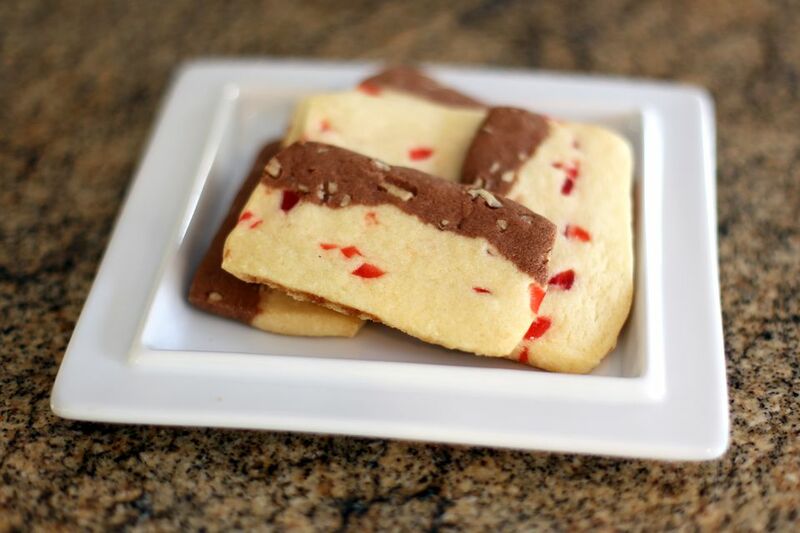 Buttery shortbread cookies and chocolate shortbread are excellent for holidays as well. To freeze the cookies, line a freezer container with foil or plastic wrap. Layer the cookies with plastic wrap between layers. Cover and place it in the freezer. Remove all or some of the the cookies as needed, and thaw them at room temperature.